You are already aware of the fact that email marketing continues to be the most powerful way to increase your bottom line results. This is true for nearly every industry on the planet. According to DMA, email has the highest conversion rate (66%) when it comes to purchases made as a result of receiving a marketing message compared to social media and direct mail. In this article, I wanted to highlight the Top 11 Email Marketing Tips to Increase Sales in Your Business. To begin with, it is important to understand the correlation between email marketing and content marketing. The two are so powerfully linked it is worth the mention. Content marketing must be the foundation for every company looking to generate leads and build their status as a market leader. Content marketing is one of the most powerful inbound marketing strategies, so long as you can use it to generate leads. You see, content marketing on its own rarely works without an effective distribution tool. This is why content marketing in combination with a solid email marketing strategy will boost your authority, engage with more of your prospects and ultimately, win more business. Click on the video below to see what we mean. Tip number 2 outlines one of the most powerful ways to combine your content with email marketing. The power combo of brilliant content coupled with a content upgrade will be one of the fastest ways for you to grow your email list. You will notice on this blog post we have a content upgrade, carrying on this conversation, providing a method to increase your email open rates by 58%. Our quick-start email guide is one example of a content upgrade in action. When it comes to content upgrades, think in terms of the main categories your blog posts are listed under. Most company blogs will have around 6-8 categories. You want to have a content upgrade available for each particular blog post category you have. Implement the content upgrade strategy and watch your subscriptions soar. There are a couple of other benefits of using the Content Upgrade Strategy, so click play on the video below to see more. Marketing automation is such a powerful tool and is compulsory for modern digital marketers. Marketing automation can help build your email list in the following ways. Dollar for dollar, pound for pound, marketing automation is making email communication so much more personalised and efficient. Get on to it today if you haven’t already. 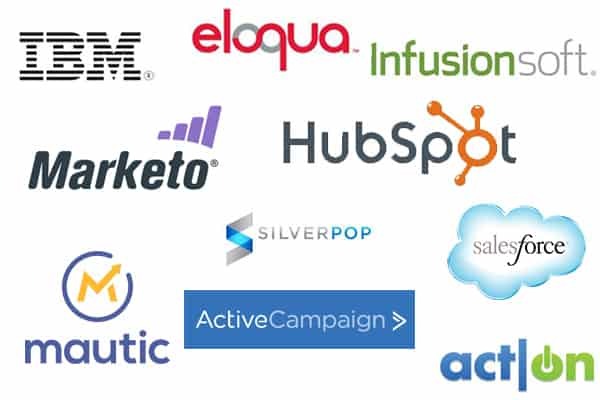 Some of the popular marketing automation platforms include Eloqua, Marketo, InfusionSoft, Hubspot, ActiveCampaign and Pardot to name a few. The frequency of your emails should be dictated by the amount of quality content you have available. If you keep emailing me an offer to sign up for a list, purchase your products or to tell me how good you are, then I’m going to unsubscribe. Instead, focus on the quality of your content and match the frequency of the quality content to your emails. So if you can write one quality post each week, then a weekly email will be fantastic. If you are in the finance industry and blog daily about the latest market updates, then a daily email is not out of the question. Clients who are trading the markets want to stay up to date, so provide that opportunity. Click play on the video below to see how often you should email your list. Reviewing your existing email automations every 3-6 months is one of the most efficient email strategies you can do. Reviewing old email sequences and followups is something very few companies do. We will look into email sequences from different lead generation assets and find promotions that don’t even exist anymore. One company we worked for had two products in their follow sequence that were no longer part of their offering. Not only that but with their revamped product list and new staff, neither of them was being mentioned. You are already aware of the fact that you are spending real money driving people to your landing page. But it doesn’t stop there. You need to stay on top of your automated email follow-ups and monitor your messages every few months. Watch the video below for more tips on reviewing your email sequence. Your headline is critical in getting that all-important open. Boring headlines get ignored and moved to trash. Creating a strong headline is marketing 101, so I’m not going to go on about the importance of this. Instead, I’ll give a technique that I use which has been passed on from the World’s best copywriters. To get the best headline, you need to write lots of them. For every email you write, you need to come up with 10-25 email subject line ideas. And yes, just to recap, that is up to 25 email subject lines per email. The beauty of this technique is that one of them will jump out at you in the midst of all the other also-rans. The email subject line that jumps out at you is the one you need to use. Having said that, one of the benefits of modern marketing automation platforms is the ability to run live A/B split tests with your emails. Once a clear winner has been found, all other emails will run with that subject line. To maximise your open rates, segmentation is one of the most powerful tools you can use. Click play on the video below to see the benefits of using segmentation. Running a webinar on Trading Gold in the next week and need to get an email out? How different would your open rates be if you could run a segmentation report as specific as that? The goal of segmentation is to identify your hottest recipients and provide them with the information they’d be highly interested in. Gone are the days of emailing everyone on your list. Get smart and use segmentation to win in email marketing. In every email you send, there should be a clear cut Call to Action (CTA). What is the goal of this email? If I could get the recipient to do one thing, what would it be? That is the clue to your most wanted action. More options = more confusion. Keep it simple and offer a clear CTA in each email. Don’t litter your email with a dozen different options. If you do, you’ll find your click through rates will plummet. A rule of thumb, which continues to be used to this day is to provide several opportunities to click forward. By several, I mean at least two, with three being an ideal number. You want to give your recipient the opportunity to get inspired by your message. Sometimes the start of your email doesn’t resonate, and your email doesn’t get the click. But as you continue, you add more layers and reason to take action and click the hyperlink. It is for this reason that having multiple opportunities to click is important. Weave it into your email and watch your click through rates soar. I’m going to keep this simple. Just don’t do it. Not only do you run the risk of getting caught for spamming people but there is potential reputation risk as well. Focus on creating quality content, quality lead generation assets and then open the conversation and engage with your potential prospects in a professional way. This is a long term game. We’re not after cheap and nasty shortcuts. Front of mind awareness. So subtle, yet so powerful. Your goal is to keep at the front of your clients’ and prospects’ minds, and you can do this by providing top notch content delivered in a timely manner. A newsletter works wonders in this case. A weekly newsletter is a great opportunity to discuss the top news of the week and perhaps outline some exciting things your company is working towards. Your goal here is to provide value. The more value you give, the more opportunity you earn for promoting your products. A good rule of thumb would be for every four pieces of quality content you provide, drop a link to one of your products or services. In conclusion, the best return on investment (ROI) and return on your time is email marketing. Hopefully, the 11 email marketing tips to increase sales are being implemented by your team. If you need help in structuring your automated emails, creating a content upgrade or implement a solid marketing automation strategy, then reach out. We’re here for you.